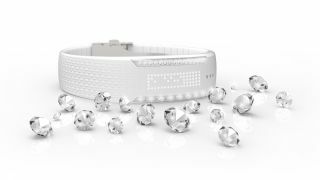 Swarovski has already adorned wrists with the Misfit Shine and it looks like Polar fitness trackers are the next wearables it's turning into a fashion statement. Called the Polar Loop Crystal, the wearable features the same abilities as the Polar Loop 2 - activity and sleep tracking, inactivity alerts, training guidance and smart notifications. The Loop Crystal shines uniquely with its 30 Swarovski crystals inlaid into two polished stainless steel decorative bezels. The white silicone textured bracelet is also customizable and secured with a small stainless steel buckle. A touch button activates the Loop Crystal's display, consisting of 85 individually placed LED lights which allows users to change between views. The Polar Loop Crystal will be available in November 2015 for $159.90/159,90€ (about £103, AU$220) from the Polar website and select global retailers.